THURSDAY, Dec. 10, 2015 (HealthDay News) -- Are you a student/athlete heading to college and hoping to steer clear of a sports injury? A new study suggests men should be careful if playing football and wrestling, and for women it's soccer and gymnastics. Football, especially, was the leading cause of the more than one million injuries suffered by college athletes in the United States between 2009 and 2014, according to researchers. They also found that more athletes suffered injuries during practices than during competition. 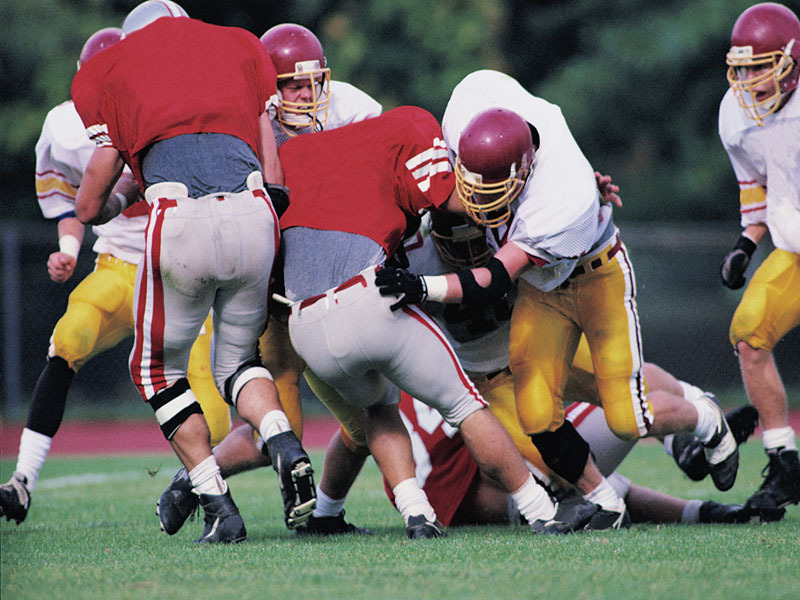 "Men's football accounts for the most college sport injuries each year, as well as the largest proportion of injuries requiring 7 or more days before return to full participation, or requiring surgery or emergency transport," wrote a team led by Dr. Alejandro Azofeifa, of the U.S. Substance Abuse and Mental Health Services Administration (SAMHSA). The researchers looked at data on injuries suffered by NCAA athletes in 25 sports between the 2009-10 and 2013-14 school years. They tabulated 1,053,370 injuries over the five years of the study, for an average of 210,674 injuries per year. Football accounted for the most injuries, at more than 47,000 per year. The sport also had the highest rate of injuries during competition, at just under 40 per 1,000 times an athlete engaged in the sport ("athlete-exposures"). However, when the researchers added in the relatively low rate of practice-linked injuries, the overall injury rate fell to 9.2 per every 1,000 athlete-exposures. That means that men's wrestling actually poses the highest risk for injury for male college athletes, with an overall rate of just over 13 injuries per 1,000 exposures. Among women's sports, gymnastics had the highest overall injury rate (10.4 per 1,000), as well as practice injury rate (10 per 1,000), while soccer had the highest injury rate during competitions (slightly more than 17 per 1,000). The researchers also found that more injuries occurred during practices than during competition in all sports except men's ice hockey and baseball. Overall, nearly 64 percent of injuries occurred during practices. That means that efforts to curb injuries "that target not only competition, but also the more controlled practice environment" are needed, the researchers said. The investigators stressed, however, that injuries suffered during competition did tend to be more severe than those suffered during practice. That's probably due to "a higher intensity of activity during competitions compared with practices," Azofeifa's team said. Overall, 4 percent of injuries required surgery and just under 1 percent required emergency transport. Nearly half of all injuries suffered by college athletes were sprains or strains, and sprains and strains also accounted for about half of injuries that required athletes to sit out for at least a week, the study found. The study appears in the Dec. 11 issue of the U.S. Centers for Disease Control and Prevention's Morbidity and Mortality Weekly Report.